Abiy Ahmed sternly says no negotiation with any entity over the issue of Ethiopian sovereignty and unity. 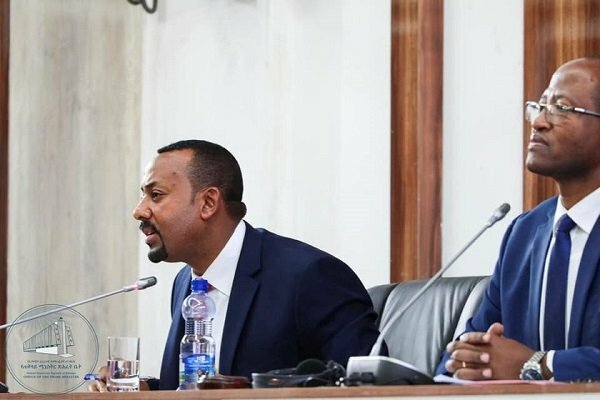 In his appearance at the Ethiopian parliament this morning, prime minister Abiy Ahmed talked at length on the basis of relation with the opposition. About 20 opposition groups that used to operate outside of Ethiopia have returned to the country after Abiy Ahmed’s administration offered opportunity for a peaceful struggle in the country. Without naming names, he raised that some opposition group were not living up to the expectation of peaceful struggle. Yet, he noted the situation Wollega,Western Ethiopia, where the defense force was deployed to restore order and law. Militant faction of Oromo Liberation Front has been operating as a de facto government in the region after it was allowed to the country. The party has been behaving as if it has a special entitlement. Abiy made it clear at the parliament today that the peace offer to opposition parties is based on principles of peace. Government used same principles during negotiation with all opposition parties. He said the negotiation was based on the principle of ending the cycle of sorting out political differences through a point of gun and resort to dialogue to create democracy. For them, it is easier when the political space in the country is narrow for they can create agenda out of the mistakes of government like complaining about the arrest of journalists, members and freedom of expression. Now it is not possible for there is no such a problem. There is no journalist in Ethiopian prison, Abiy added. “Now is the time only to think and come up with an idea and mobilize Ethiopians to get Ethiopia out of poverty, ensure peace and the unity of the country,” he reminded politicians and parties who do not seem to prioritize those ideals. The prime minister also attempted to address the question of many Ethiopians as to why government is lenient when it comes to enforcing the rule of law in the country. He added “We do not negotiate with any entity over the sovereignty and unity of Ethiopia.” He likened posing challenge to the unity of Ethiopia as an outright deceleration of war on Ethiopia. His administration is also increasingly facing resistance from Tigray regional state. Last week, the region rejected the formation of identity and boundary commission. At times, there are even rants about breaking away from Ethiopia – mostly from activists from the region.